Wiz Khalifa will See You Again. What do Wiz Khalifa, Mark Ronson, Meghan Trainor, Enrique Iglesias, Taylor Swift, Katy Perry, Justin Bieber and Psy all have in common? As you might have guessed if you read the headline, they all have videos with more than a billion views on YouTube. 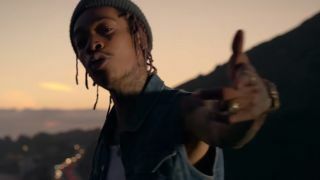 Khalifa's See You Again, a tribute to the late Paul Walker and featured on the Furious 7 soundtrack album, is the newest member of that exclusive club. YouTube announced the news with a post on its Trends blog. See You Again is the second-fastest clip to reach the magic 1,000,000,000, taking just 184 days to get there. It's beaten only by Psy's Gangnam Style, which did the same trick in 160 days, but then the South Korean pop smash hit holds just about every record going on YouTube. The success of See You Again is indicative of a broader trend: we're all watching more videos than ever before, and the rate at which clips become successful is accelerating. "At the start of this past June, only two videos had reached that echelon," writes YouTube's Kevin Allocca. "But in just the past six months, EIGHT additional videos crossed the mark." The next one expected to hit the same heights is Counting Stars by OneRepublic. We imagine Wiz Khalifa and Charlie Puth will have to go through some kind of initiation ceremony the next time the Billion Views Club gets together - presumably Taylor Swift and Katy Perry are in charge of proceedings, as they have two entries each in the top 10 list.